Thank you for supporting the Professional Development Summit (pdsummit.ca). Please enter your company name, confirm your sponsorship type and click on the make Make Payment button at the bottom of this page to continue. Required - enter your name if you do not have a company. All Sponsors will be promoted through all Associations through email blasting, Social Media and the PDS website. All Sponsors will be recognized throughout the day. All sponsors can provide items for event bags. All Sponsors can provide $100+ value giveaways at networking reception. All Sponsors can provide Banners at the event. There will be a max of 8 Exhibitor tables available. All Exhibitors can use a Business Card Draw at their table to draw traffic and the draw can be done at the Networking Reception. Event Registrations for 15 people, must be registered under “Sponsorship Registration”. Add-on Ticket Packages available for additional registrations. Your poster or banner at entrance during the symposium, with recognition as the Presenting Sponsor. Prominent logo recognition as Presenting Sponsor on marketing material and in the registration package. Recognition in regular social media distribution and throughout PDS marketing material, with your logo prominently displayed. Being thanked as the Presenting Sponsor throughout the day. Ideal topic based on Technology Innovation - where are the trends going, technologies that will impact the future, or demonstrate leading edge technology that company is current involved with. Event Registrations for 10 people, must be registered under “Sponsorship Registration”. Your poster or banner at entrance during the symposium, with recognition as the Networking Reception Sponsor. Prominent logo recognition as Networking Sponsor on marketing material and in the registration package. Being thanked as the Networking Sponsor throughout the day. We have a total of 4 packages available at the Platinum level with the option of Deluxe Platinum (with Exhibitor Package) or Platinum (without Exhibitor Package) however a max of 2 Exhibitor packages. Event Registrations for 8 people, must be registered under “Sponsorship Registration”. Your poster or banner at entrance during the symposium, with recognition as the Deluxe Platinum Sponsor. Prominent logo recognition as Deluxe Platinum Sponsor on marketing material and in the registration package. Being thanked as a Deluxe Platinum Sponsor throughout the day. Your poster or banner at entrance during the symposium, with recognition as the Platinum Sponsor. Prominent logo recognition as Platinum Sponsor on marketing material and in the registration package. Being thanked as a Platinum Sponsor throughout the day. Event Registrations for 5 people, must be registered under “Sponsorship Registration”. Your poster or banner displayed at the event with recognition as a Deluxe Gold Sponsor. Logo recognition as a Deluxe Gold Sponsor on marketing material and in the registration package. Recognition of your organization and attending personnel at the PD Summit. Recognition in regular social media distribution regarding the PD Summit marketing material, with your logo displayed. Event Registrations for 2 people, must be registered under “Sponsorship Registration”. Your poster or banner displayed at the event with recognition as a Gold Sponsor. Logo recognition as a Gold Sponsor on marketing material and in the registration package. Event Registrations for 4 people, must be registered under “Sponsorship Registration”. Your poster or banner displayed at the event with recognition as a Deluxe Silver Sponsor. Logo recognition as a Deluxe Silver Sponsor on marketing material and in the registration package. Event Registrations for 1 person, must be registered under “Sponsorship Registration”. Your poster or banner displayed at the event with recognition as a Silver Sponsor. Logo recognition as a Silver Sponsor on marketing material and in the registration package. Your poster or banner displayed at the event with recognition as a Bronze Sponsor. Logo recognition as a Bronze Sponsor on marketing material and in the registration package. 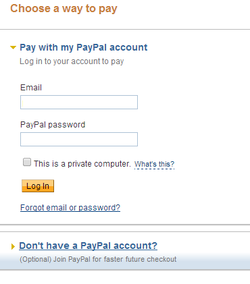 On the following screen (once you click the Make Payment button) click on the 'Don't have a Paypal Account?' link to pay by credit card.